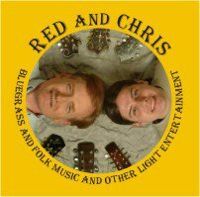 Red and Christopher Henry have been performing at folk festivals for the last few years. On this new CD, they play and sing their favorite numbers with mandolins and guitar. Red also contributes two of the hilarious stories which enliven their stage show. Includes: Cold Winter's Night, Tallahassee, Gospel Snakes, Red Wing, Big Jim Folsom, The Kennesaw Line, Blue Night, Abraham Washington, Bouncing on the Moon, Red's Zeppelin, and more. If you'd like the physical CD use the "Buy CD" button to the left. If you'd like to download individual tracks, or the entire album, use the button below. It will take you to CDBaby and your digital music purchase will be completed through their website.